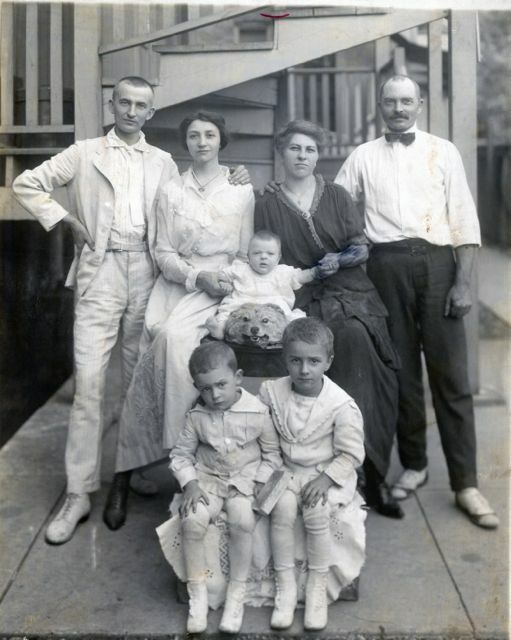 Family Archaeologist: Family poses with baby on dead dog! DON'T CROP IT, IT MAKES IT REALLY FRIGHTENING! SOME PEOPLE POSE ON BEARSKIN RUGS, THIS WAS YOUR FAMILY'S VERSION--PROBABLY EASIER TO FIND A STUFFED DOG THAN A STUFFED BEAR IN CHICAGO! Insert a cartoon balloon next to Sam's head and let him tell us. He seems like he has something to say about it. It's an arresting and odd photograph. I'd guess the photographer provided the prop. When Syd got professional photographs a few years ago, the photog suggested trying a few shots with a stuffed parrot posed on Syd's shoulder. Well, perhaps there are two options: 1) Photoshop the dog out of the pic to have a freaky canine-free photo, and 2) Just keep the dead dog in the pic for historical value's sake. Thanks for sharing these most interesting photos! I vote for keeping the dog in! It is a little strange, but makes for great conversation! Thanks to everyone for your comments and suggestions--one person, who didn't comment here, sent me a quick version with the dog removed! Thank you! I will probably keep the dog as the original and try to use a simple program to remove it in another I kinda like its weirdness. It speaks of another time, when folks weren't obsessed with presenting their families in ways that would meet with world-wide approval. Jacqi--the balloon idea is hilarious! 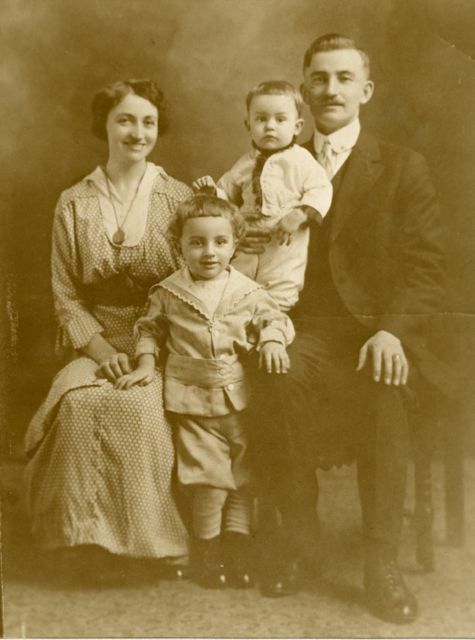 And my dad, Fred, does look like he's annoyed just to have to be there -- dressed all in uncomfortable white clothes! Maybe it was a beloved family pet, although I have had no pets I would want around the house stuffed! I might take the head out if I was blowing up the two boys but definately leave it in with the baby sitting on it. Yikes! I know this is creepy but I find myself laughing hysterically. You see/learn something new every day. Aside from the "dog," this photo is so interesting. There's lots of detail to look at (except Lightbox doesn't enlarge). 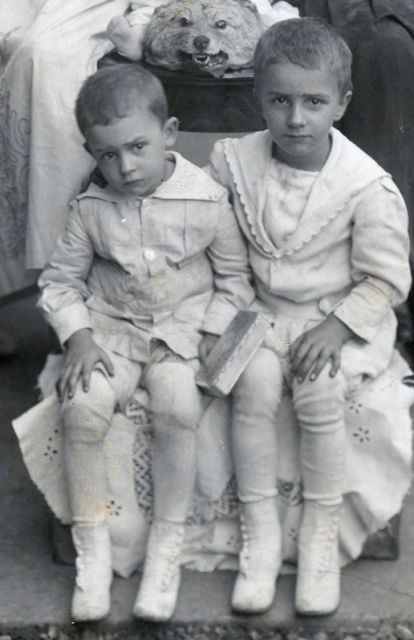 What is the little box between the two boys? Did you notice Lisi's skirt and the detail work on it? Also, I think it's interesting that she (or someone) put doilies (probably handmade) on the box the boys are sitting on. I have to agree with you, Nancy, and thanks for taking such a close look. The boys, with their all-white clothing with wide collars and white button-up boots, must be quite uncomfortable. Whether it's a dog or a wolf (seems the snout is a little short for a wolf) I can't know for certain. Maybe we'll just say canine!